Who is buying all those properties and what does it mean for the apartment building investment cycle? Mark Hickey of CoStar put out a piece looking at who was responsible for the near record $65.8B of apartment building investment in 2012. CoStar’s numbers show that private owners/developers did just about half of all acquisitions last year and institutions were in for 12%, both near their recent trends. REITs on the other hand increased their share by a third, responsible for 12% of sales volume last year. Interestingly the sellers were pretty much the same groups, except REITs who were the largest net buyers last year. 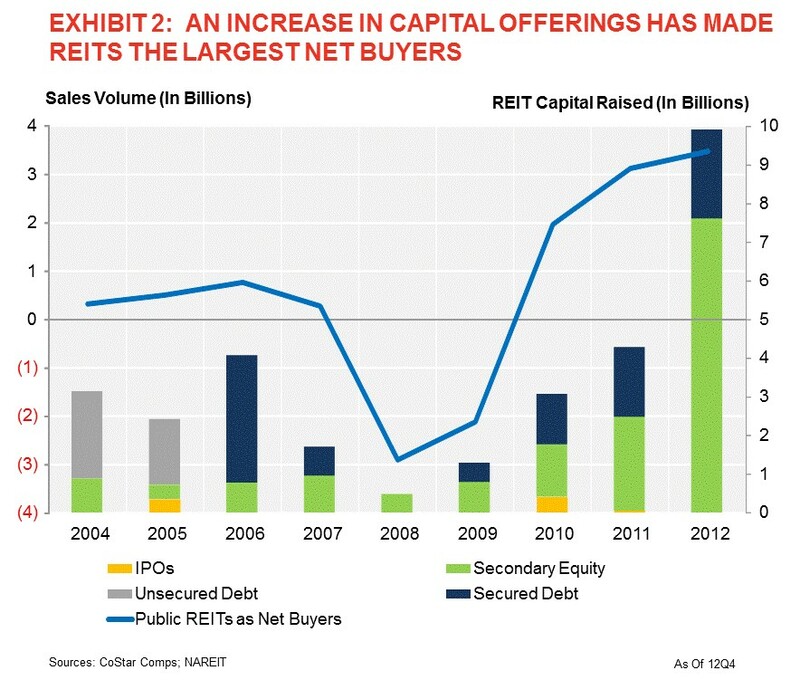 Last year REITs raised 15x the equity they did in 2008 (and 20x the total capital). Up against pockets that deep Continue reading Who is buying all those properties and what does it mean for the apartment building investment cycle? Posted on May 7, 2013 May 8, 2013 Categories Apartment Building Investment Cycle, Commercial Real Estate, Multifamily Investments, The Economy and Current AffairsTags acquisition, Apartment Building Investing, apartment building investment cycle, apartment construction, apartment demand, apartment investments, Archstone, Avalon Bay, buying opportunities, Cap Rates, CoStar, Equiyty Residential, investment property, John Burns, Lehman, multi family investments, Multifamily Executive, Real Estate Investment Trust, REIT, Sam Zell, Tishman Speyer2 Comments on Who is buying all those properties and what does it mean for the apartment building investment cycle?